In a little under a year, the Aero has become Gigabyte’s flagship gaming laptop product line. 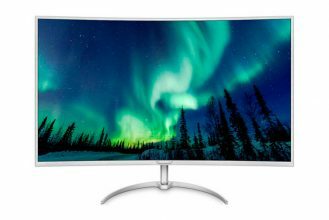 These highly refined computers offer an excellent compromise between compactness and performance in addition to a large, high-quality display. The newest member of this product line, the Aero 15 V8 (i7-8750H), does not bring any revolutionary new features to the table, but it is the first Aero computer to incorporate a 6-core Intel processor. With the V8, Gigabyte has concentrated on improving the Aero 15’s internal components rather than its exterior design. 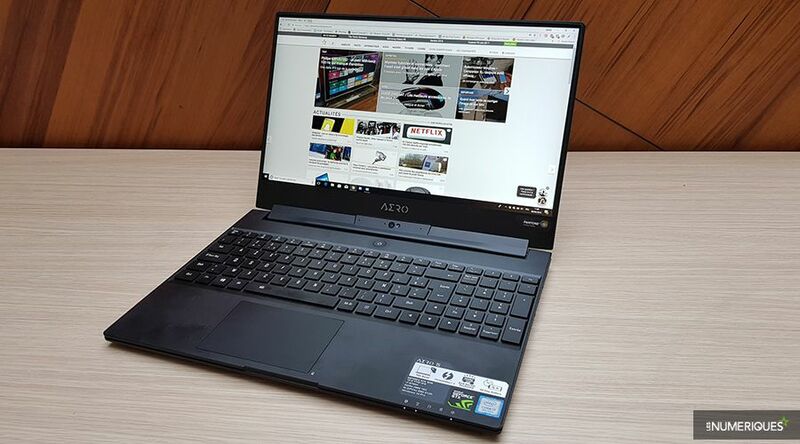 In terms of its outward appearance, the Aero 15 V8 is very similar to previous versions – which is a good thing considering how much effort this Taiwanese manufacturer has put into perfecting the Aero’s design. The Aero 15X V8’s sober look can be attributed in large part to its black aluminum chassis. 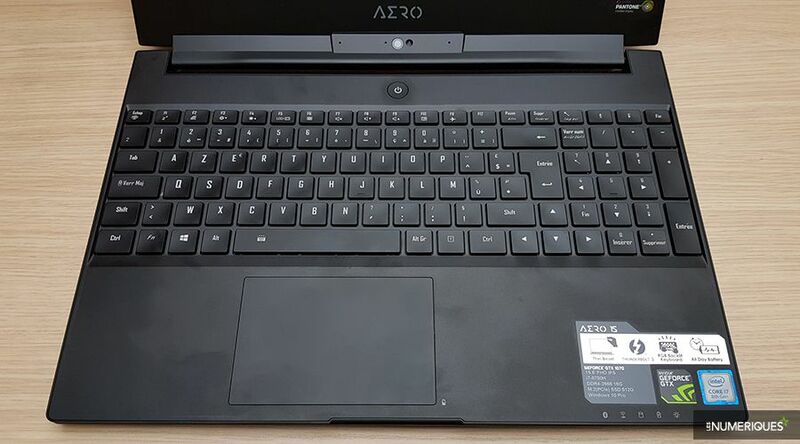 The matte black coating used on top of and around its keyboard is in keeping with the Aero’s overall color scheme; it does, however, have a tendency to reveal fingerprint smudges. The only flashy elements found on this computer are its white backlit Gigabyte logo and its RGB keyboard backlighting (can be deactivated) which extends across the full width of the Aero’s chassis – even under its numpad. The Aero 15 V8’s keyboard also provides for a very comfortable typing experience: its keys have a good amount of travel and return force in addition to being slightly concave… This keyboard takes some getting used to and one could argue that its keys are spaced too closely together. On the other hand, it is hard to find any fault with the Aero 15X V8’s trackpad which is very precise and comfortable to use and which has been impeccably integrated into the computer’s overall design. 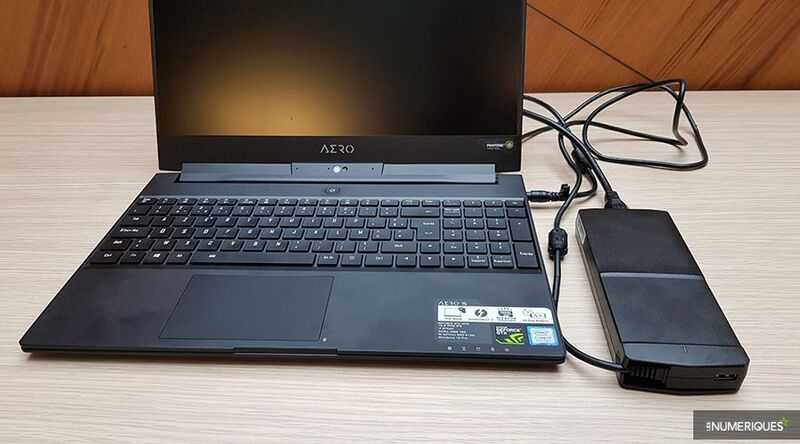 The Aero 15X V8 (i7-8750H) also has very comprehensive and up-to-date connectivity, in large part thanks to its Type-C/Thunderbolt 3 USB port and its UHS-II compatible SD card reader which have a theoretical data throughput of up to 300 MB/s – a convincing argument for any photographer or videographer who needs to download large files on a regular basis. 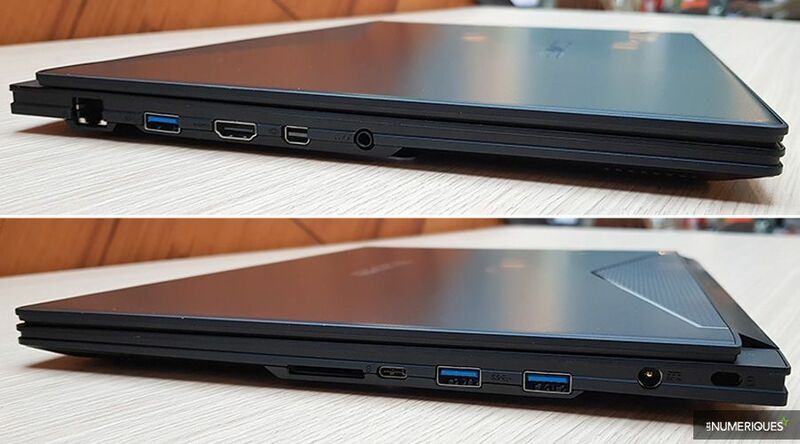 This computer’s array of connectivity also includes a DisplayPort 1.4 connector, an HDMI 2.0 connector, a Gigabit Ethernet port, two USB 3 Type-A ports as well as a combination audio jack. While the Aero 15X V8 (i7-8750H) is equipped with the same graphics card as its predecessor – the Aero 15 X (2017) – it now incorporates a 6-core processor – inevitably resulting in more heat and a greater reliance on ventilation. Nevertheless, the Aero 15X V8 is capable of efficiently regulating its temperature without compromising the sleekness of its overall design. After 1 hour of playing Metro: Last Light, we were able to detect two hot spots – one at 54.1°C on top of the keyboard near the front of the computer and another at 63.5°C underneath the chassis. On the top side of the chassis, the heat was localized to very small areas and the keyboard’s temperature always remained within acceptable limits. As far as noise is concerned, we recorded an average noise level of between 46-48 dB. While the Aero 15 V8’s fans were clearly audible, the noise they produced was muffled and discrete; the Aero 15 V8 is, however, noisier than the Aero 15 X (2017) which never exceeded the 46 dB threshold. It is worth mentioning that the Aero 15X V8 can be opened using a Phillips head screwdriver. Once you have removed its dozen screws, you can easily add an extra stick of RAM (there is an empty slot reserved for this purpose) or replace its M.2 format SSD drive. The Aero’s display has always been one of its major selling points and the Aero 15X V8 is no exception. The frame surrounding the Aero 15X V8’s display is very narrow, allowing its IPS display panel to occupy over 80% of the available surface area. The Aero’s display also has a very decent contrast ratio (for a matte display) of 950:1 as well as a maximum luminosity of 300 cd/m² – ensuring particularly good readability. The other main advantage of the Aero 15X V8’s display is its near-perfect color rendition. It has an average Delta E of 2 (remember that Delta E is a measure of the difference between displayed colors and real colors and that a Delta E value of under 3 is considered to be excellent) as well as a well-balanced color temperature of 6 700 K (the standard being 6 500 K). As a result, the Aero’s display has very good color rendition in addition to good grayscale rendition thanks to its highly stable gamma curve. Last but not least, the Aero 15X V8’s display is capable of achieving a refresh rate of 144 Hz and has an image persistence rate of 11 ms, which is frankly pretty good for an IPS display. The Aero 15X V8 has the particularity of incorporating Intel’s brand new Core i7-8750H processor. Equipped with 6 cores / 12 threads, it has a base frequency of 2.5 GHz, a turbo frequency of 4.2 GHz, and a TDP of 45 W. This new generation of Coffee Lake CPUs will eventually serve as the replacement for Core i7-7700HQ processors which are still very prevalent on laptops equipped with a dedicated graphics card. Our test model was also equipped with 16 GB of DDR4 RAM (2 666 MHz) and a 512 GB Toshiba SSD. When put to the test under various benchmark conditions (3D computations, audio and video conversion, file compression, photo editing), the Aero 15X V8 performed much better than other laptops equipped with a Core i7-7700HQ processor. This difference was especially noticeable when using Cinebench (3D computations); the Aero 15X V8 was almost twice as fast (38 seconds) as an MSI GE72 Apache Pro equipped with a Core i7-7700HQ processor (56 seconds). When converting video using Handbrake, the MSI GE72 Apache Pro took 92 seconds versus the 70 seconds taken by the Aero 15X V8. In conclusion, the performance characteristics of this new Aero 15X are nothing short of excellent; the Aero 15X V8’s performance even approaches that offered by a good desktop PC. Unsurprisingly, it receives a 5-star rating in this regard. It should provide enough processing power to comfortably perform a wide variety of tasks. 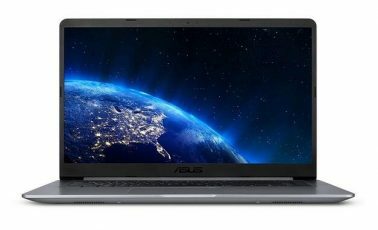 As far as its graphics card is concerned, nothing has changed since the previous version of the Aero 15 X (2017). The Aero 15X V8 still uses a Nvidia GeForce GTX 1070 “Max-Q Design” graphics card equipped with 8 GB of RAM. Operating at an average frequency of 1 544 MHz, this GPU offers similar performance to that of a mobile GTX 1070 graphics card. Contrary to the GTX 1080 Max-Q, which has seen its operating frequency lowered, the GTX 1070 Max-Q’s operating frequency has not been lowered in order to lower power consumption; as a result, it offers more unbridled performance. In addition to its very good power index of 122 (based on 3D Mark), we arrived at the following results under gaming conditions (tests performed in Full HD 1080p, maximum details, Hairworks deactivated for The Witcher 3): 60 images/second for Metro: Last Light, 69 i/s for Rise of the Tomb Raider, 68 i/s for The Witcher 3, 78 i/s for Star Wars Battlefront II, and 53 i/s for Assassin’s Creed Origins. In terms of its physical dimensions, the Aero 15X V8 is a little larger than its predecessor, but not by much. The Aero 15X V8 remains remarkably compact given its impressive hardware configuration. Weighing in at 1.9 kg and with a thickness of 19 mm, the Aero 15X V8 will fit easily into any carrying bag along with its charger. On the other hand, the Aero 15X V8’s battery autonomy is lower than that of the Aero 15 X (2017). In “normal” battery consumption mode, the V8 was unable to last for more than 6 hours and 22 minutes during our video streaming test (Netflix running in Chrome, luminosity at 200 cd/m², keyboard backlighting deactivated, headphones connected); in contrast, the Aero 15 X (2017) had a battery autonomy of 7 hours 50 minutes under the same test conditions. This was something of a disappointment, especially since Gigabyte advertises a battery autonomy of over 10 hours for its new device. The Aero 15X V8’s sound quality lies somewhere between average and good. In this regard, it is the Aero’s speakers which are a disappointment. Suffering from a rather severe distortion, the sound they produce can be somewhat unpleasant. What’s more, the Aero is only capable of delivering a very restricted range of bass tones – to the point where even mid-range bass tones are almost nonexistent. Voices are intelligible and the Aero’s speakers should be sufficient for voice communication purposes. There are two additional details worth mentioning concerning the Aero’s speakers. Firstly, the placement of its speakers underneath its chassis is in large part responsible for the Aero 15X V8’s mediocre sound quality. Secondly, the Dolby software which comes preinstalled is almost entirely useless in the sense that it imposes a very unpleasant level of dynamic compression. New, very powerful Intel Core i7-8750H processor. Still as good as ever for gaming. Impeccable display quality and color rendition. Thin-profiled and lightweight (given its impressive hardware configuration). Keyboard’s keys are too closely spaced. To reiterate, the newest version of the Aero 15 X (2017) is a success. 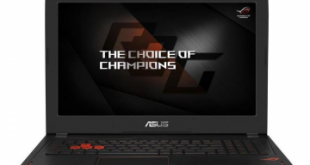 The Aero 15X V8 can be classified as a very high-end computer due to its brand new 6-core Core i7-8750H processor, its tried and true GeForce GTX 1070 Max-Q graphics card, and its 144 Hz display with near perfect color rendition. 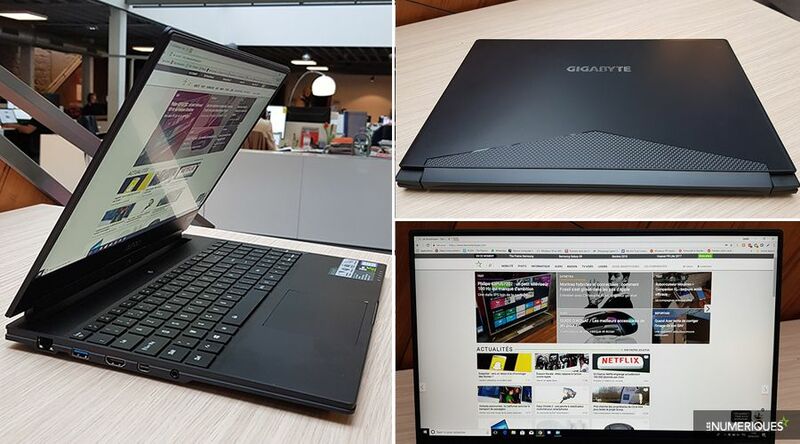 In short, the Gigabyte Aero 15X V8 is one of the best 15-inch notebooks on the market – an ideal laptop as much for gaming as for working.